In a disappointing performance tonight by WBA interim super middleweight champion Vincent Feigenbutz (21-1, 19 KOs), he was forced to squeak by fringe contender #13 WBA Giovanni De Carolis (23-6, 11 KOs) by a disputed 12 round unanimous decision at the dm-Arena in Karlshrue, Germany. 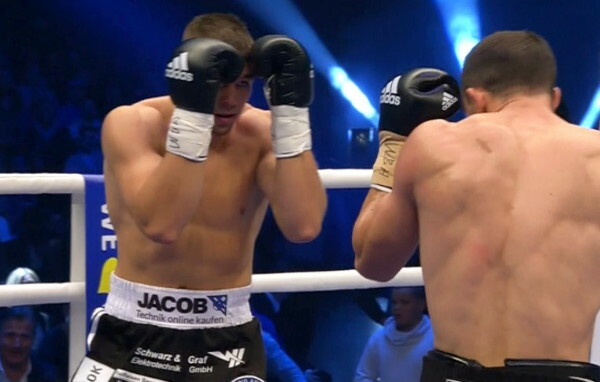 Many boxing fans felt that the 20-year-old Feigenbutz should have been given a defeat rather than a victory, as he was outworked by the 31-year-old De Carolis in the majority of the rounds. What was even more embarrassing for the highly hyped Feigenbutz was him getting knocked down in the 1st round by a right hand from De Carolis. Feigenbutz showed no ability to react to the telegraphed right hand from De Carolis. A blind man could have seen that punch coming from a mile away and got his left hand up to block it, but Feigenbutz just stood there like a dummy and took the blow on the side of his head without doing anything. Feigenbutz tried to talk the referee out of scoring it a knockdown, but on replay it was a clear knockdown. Feigenbutz was hit by a bowling ball-like right hand and knocked flat. After the knockdown, De Carolis pummeled the inexperienced Feigenbutz for the remainder of the round. The judges scored the fight 115-113, 115-113, and 115-113. Those scores were extremely generous to Feigenbutz, because you can make an argument that he lost the fight by a 9 rounds to 3 score. He fought well enough at the end of the fight to win some of the later rounds after De Carolis had faded. The win now puts Feigenbutz in line to face the winner of the Felix Sturm vs. Fedor Chudinov fight for the WBA “regular” super middleweight title. Needless to say, Feigenbutz will almost surely lose to either of those fighters. At this point there’s really not too many of the quality fighters in the super middleweight division that Feigenbutz actually beat. He’s just too flawed, too slow and too clumsy to beat the better fighters in my view. Feigenbutz’s promoters at Sauerland Events seem to believe in him, but I expect them to be disappointed when he faces the Chudinov-Sturm winner and gets thrashed and likely knocked out. I don’t Feigenbutz is any better than he was three years ago when he was knocked out in the 3rd round by Roman Alesin. There’s no real improvement. The only thing I see is he’s been matched against weak opponents and now has a record based on fluff guys. If Sauerland Events has their heads on straight, they’ll keep Feigenbutz away from anyone good for the next five to seven years and see if they can develop him. I’m not sure that Feigenbutz can be improved though, because he fights like he’s got two left feet. When you have a fighter that is as flawed as Feigenbutz, you’re stuck with waiting for a number of years to see if he’ll be able to develop. Right now, I don’t see Feigenbutz ever getting to the level where Arthur Abraham is right now. I don’t rate Abraham as being a good fighter, which tells you what I think of Feigenbutz. It might be better for Sauerland Events to cut their losses and dump Feigenbutz. While they’re at it, they might want to sweep out some of the other fighters in their stable like George Groves and David Price. If it was me running Sauerland, I would have dumped all three of those fighters ages ago. Feigenbutz looked so flawed in the fight that you have to wonder how in the world he ever became the interim WBA super middleweight champion in the first place. The answer is easy. Feigenbutz beat 38-year-old little known fighter Mauricio Reynoso last July by a 3rd round knockout to win the title. That was the World Boxing Association that put the WBA interim 168lb title on the line for that fight. So instead of Feigenbutz having to beat a good contender like Martin Murray, Gilberto Ramirez, Rocky Fielding or Callum Smith for the WBA interim title, he only had to defeat the 38-year-old Reynoso.